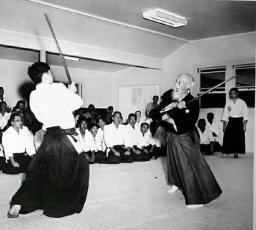 Morihei Ueshiba who is the founder of the Aikido was born on 14th December 1883 in Wakayama. Today Wakayama area is known as Tanabe. He was the only son of a farmer family. He also had 4 sisters. His samurai determination and political interest sourced from his father, Yoroku. His mother thought him about art, religion, and poem. When he was a child, he was a weak and sick kid. Therefore, he preferred to stay at home instead of playing with other children. He was interested in listening to the myths about the St. En no Gyoja and St. Kobo Daishi. The Buddhist religions had an important influence on him. In fact, he planned to be a priest when he was a child. To prevent these wishes, his father told him the stories of the samurai Kichiemon. His father also encouraged him about practice sumo wrestling and swimming. When he was 12, his father who is a member of the local council was a well-known person in the village. There were some political opponents of his father, and they usually argued about political topics with his father in their home. The opponents were not kind men. In fact, the public was called them as “tyrants of the city”. Morihei Ueshiba hated these people and these arguments in their home. He decided to be stronger to kick them from their home. In the next years, he learned about the fishery. He also solved one of the most important problems of the village which is about the borders. According to this success, he became a well-known person in the village like his father. In fact, he was dealing with a part of his father’s jobs. He was a wonderful teenager. When some people work two times than others, he works four times with his unbending soul and indefatigable will of work. If someone carries 40 kg, he carries 80. He attended a local competition which is brass forging competition. For the perfect result, brass must be forged by a sledgehammer during cooling. Due to the shape of the sledgehammer and the consistency of the mixture, the competition is very difficult. Morihei Ueshiba won the competition by defeating 10 competitors, even he broke the stone pot. After this victory and others, public kept him away from the competition by offering him some tea and cookie to prevent him to break more pots. In 1901, at the age of 18, he went to Tokyo with his uncle who is a big merchant. He discovered his interest in martial arts. He loved Ju Jutsu in Kito-Ryu dojo and sword practices in Shinkage Ryu. But unfortunately, a serious beriberi disease forced him to return home. He got married to Itogawa Hatsu here. After getting well during the Russian-Japanese War, he wanted to join the army. However, he couldn’t meet the minimum requirements due to his height just below five feet (approximately 153cm). He got so sad that he went to the woods and hung from the trees. He succeeded in his second attempt to pass the test and joined the army as infantry in 1903. He was appreciated by commanders during the mission and his commander recommended him to the National Army Academy, but because of various reasons he rejected it and resigned from active duty. Morihei returned home to the farm. He had gained strength during his military service and he was eager to continue his physical education. His father built him a dojo on the ranch and invited the well-known Jujitsu master Takaki Kiyoichi to train him. During this time, young Morihei got even stronger and discovered that he has talent. He also began to pay more attention to political affairs. In the spring of 1912, when he was 29, he and his family moved to Hokkaido. The village has begun to prosper after a few years of struggle. Ueshiba had become incredibly muscular that the force in his arms was legendary. At this time in Hokkaido, he met with the great master of the Daito-Ryu Aiki Jutsu, Sokaku Takeda. After meeting Takeda and realizing that he could not be rival to him, Ueshiba left everything and focused on training. About a month later, he returned to Shirataki, built a dojo, and invited Takeda to live there, as he would accept later. Takeda was an extremely harsh tempered man. He was not forgiving even the slightest of his student’s mistakes and tormented them unreasonably. However, Morihei was not bothering himself for that and was giving his full attention to courses, he was even forgetting about food and sleep. This fact has a lot to do with the Aikido today. During those days Budo students were paying their masters about three hundred to five hundred yens (one yen is equal to half a dollar) for every technique they learn. In addition, Morihei was chopping woods for his teacher and carrying water to him. At the end of his training, he spent all his capital remained with his family. In the end of spring 1919, Morihei received a telegraph saying that his father was very sick. After that, he resigned all his belongings to his master Takeda and left Hokkaido. When the train arrived home the first thing he heard was people talking about a man named Onisaburo Deguchi who claim to be the leader of a new religion called Omotokyo. Morihei thought that the best thing to do for his father was to go to Ayabe, the capital of the Omotokyo religion, and to consult with the priests for his father’s health. Morihei was interested in spiritual events and religions starting from his childhood and his family was always supporting him. After he talked with Priest Deguchi he felt like something was stuck deep inside his soul. When he went back to home again his father was no longer alive. While he was struggling to cope with the death of the most beloved person in his life, he swears an oath to break his inner chains and further his studies to find the essence of Budo. After that event, his life was changed completely. Sometimes he was sitting on top of a rock wearing a white dress, sometimes he was praying kneeled on top of a mountain. He was always murmuring Shinto prayers. The people who know him were worried about him they were thinking he was going mad. At the end of 1919, he remembered Deguchi and he moved to Ayabe with his family. He found the light to brighten his soul. He settled on a house in the skirts of a mountain in Ayabe. He both concentrated on Ju Jutsu theory and worked with Deguchi actively until 1926. As his studies went further he developed an insight to sense the aims of his enemies. I have been self-taught in budo since the age of 15, I have taken kendo and jujutsu lessons from various masters in various provinces, mastered all the traditional budo arts I studied in a few months but nobody taught me the essence of budo. I finally knocked the door of religions to find my answers, but it was impossible to get an answer that would satisfy me from there. At the end of that spring of 1925, I remember very well, when I began to walk in that garden, suddenly the universe began to crack and a golden spirit sprang from the floor, encircled my body and turned me into gold. At the same time, my mind and my body were enlightened. I could understand the whispers of birds and feel the thoughts of God, the creator of the universe. This wonderful moment that quickly passed was an experience he had for the first time in his life. It influenced his whole life after that, changed it and made the birth of Aikido. While Sensei had been living in Ayabe, Deguchi told everyone he met that there was “a hell” of a great warrior beside him. He referred to Sensei’s house as hell. Maybe that was the reason why he was visited by varied people. Amiral Seikyo was one of them. Later, he would get in touch with the navy and initiate Sensei’s movement to Tokyo. Hiderato Kubota, Yukota Otsuki, Sogetsu Inagaki, Ginzo Oshikawa and Yoichiro Inoue who were the significant characters of that time were his students. Kubota (known as Nishimura, Judo 6th dan) was a student at Waseda University. He was important in terms of Judo and encouraging people around him to learn aikido. Kenji Tomiki and Nobubumi Abe were examples of this. O’Sensei’s movements became widespread. He went to Osaka and Kyushu after returned from Tokyo. He was constantly going invitations. However, there was no dojo that he went regularly. A man called Wasaburo Asano had an impressive status while he was working with Deguchi Asano, Wasaburo Asano’s brother, met Sensei and encouraged him to spread his art. He kept in contact with people and Amiral Isamu Takeshita, his classmate and a practitioner of budo, was one of them. He invited Sensei to Tokyo and they met at the Kiyoshi Omeda’s villa. There was a fellow-feeling between them so Amiral Isamu Takeshita decided to be a sponsor for him and invited him to Tokyo frequently. Kont Gonnohyoes joined them once and was astounded by Sensei’s spear talent. Others watched him too and an elite group decided to take the course. In addition, there was an arranged course for imperial guards who hold at least fifth dan. It continued for 21 days in Aoyama castle. A temporary dojo which was visited by elite groups from different environments was founded in Ichizaemon Morimura’s villa. Sensei moved to Tokyo from Ayabe at the beginning of 1927 with his family. Sensei was invited to Naval Academy as a teacher, most of the students and teachers were taking lessons from him then. Actors and dancers who were the best in their area, including famous actor-Kikugoro, attended the lessons in order to learn Aiki movements. The number of people who took the course was increased. Yoichiro Inoue who had been known by master since his childhood, Takeshi Nishimi who was the first deshi of Tokyo dojo and 6th dan in judo, Hisao Kamata, and Kikuo Kaneoka were few of them. New registration wasn’t possible anymore. He moved to Shiba Takanowa again but the house was full after 6 months. Finally, the necessity of dojo and house for O’Sensei was recognized and a committee was established to do that. A wide house took place in the top of Mejiro would be used until the original one was ready. “To tell the truth, I wanted to join Ueshiba under the Kodokan roof. However, it was impossible since he was working on his own school which I respected. So, I chose several people who were talented in our school and set them to take lessons from Ueshiba. The new dojo with 80 tatamis opened in Ushigome (now Shinjuku) Wakamatsucho under the name “Kobukan Dojo” in April 1931. Along with this opening, Sensei set a series of strict rules in order to prevent Aikido from being used out of purpose and misused. He was observing the characters of new students who applied and did not approve those whom he didn’t consider appropriate. Even though they didn’t post any ads, Dojo grew in size very quickly. During this time, there were around 30-40 students, uchi-deshi, who were extremely lively and working on Aikido. Almost all of them were above 80 kg and came from high-grade judo and kendo. They were working on Aikido so intense that the name of Dojo became known as “Hell Dojo of Ushigome” in no time. Students were in Dojo’s own world, in a place completely away from what happened in the real world. These ambitious and curious students were investigating the secrets of Aiko under the supervision of Sensei and gaining a better understanding of the world. On October 13, 1932, the “Budo Enrichment Agency” (Budo Sen’yokai) was established. O’Sensei was its chairman. At that time, a new dojo with 150 tatamis was set up in Takeda, Tamba province to get energetic young students. O’Sensei bought an old house in Takeda, near this place, making it the center of the institution. People who know that O’Sensei participate training often visited the dojo. If it was not supported by sponsors, like O’Sensei did not allow any demonstration and gathering spectators to watch it, at other times he immediately sent away people who are reckless, bad dressed or having disrespectful attitudes from the dojo. O’Sensei started to take precautions against the wrong use of techniques accompanying the growing Aikido community. For new students, he was asking at least two recommendation from qualified people. Apart from daily lesson hours, there were many private lesson hours because some of the students were elderly, some of the elders of the country, some budo masters, and some of the children of very important individuals. Deshis’ had to work from virtually no rest. In studies, O’Sensei gave more importance to Aikido than other Budos. As a matter of fact, Aikido students who had a brief time kendo education won all competition and these students brought cups that given by the empire to O’Sensei. Anyone working on Budo clearly knows Aikido. People who were working on Kendo and Judo were visiting the dojo without hesitation. In 1939, “Kobukan Dojo” changed to “Kobukai Foundation” and officially approved in 1940. Isamu Takeshita was brought to head of Kobukai Foundation. After the foundation of the center dojo at the city center, O’Sensei started looking for a place where he could be more comfortable besides budo, where he could deal with garden works. O’Sensei settled Ibaraki suburban -today as known as “Ibaraki Aikido Dojo”- in Iwama. Therefore, “Aiki Temple”, which is desired tenaciously from O’sensei was established. Then, a dojo with 40 mats was established on a corner of 72500 m2 land. The temple became a sacred place for Aikido in short time. During the war, the master attended to agriculture here. After the war, old students came to O’Sensei again to work on Aikido techniques in order to bring to perfection. Although during the war, all qualified Aikidokas spread different places, Aikido was carried out at Kobukai Center by the son of O’Sensei Kisshomaru Ueshiba and headed by Kisaburo Osawa. Courses were also available at various places. After the war, there was a decision to prohibit all budo activities. The day of reorganization was anticipated with the hope of rebirth. The preparatory council was convened in Tokiwa Villa in Tokyo Marunouchi with 53 people including the prince Konoe on 22 October 1945 and the name of the foundation was changed as “Aikikai”. The new foundation was approved on 2 February 1948 and the Aikido movement was born silent but powerful again. After WWII, substantial changes have also emerged in the changing world and the Aikido management policy. Japanese Ministry of Education accepted the new budo and officially registered the Aikikai Foundation (Zaidan Hojin Aikikai) as a national institution dedicated to the development of Aikido art. O’Sensei Morihei Ueshiba handed over responsibilities for almost everything such as the management of the organization, the control of the spread of art to his son Kisshomura and he chose to stay alone in Aiki Temple out of Tokyo to take great steps in the spiritual dimension on Aikido. The spiritual focal point of this movement is covered by Aiki Temple. He devoted the temple to the spirits of Shinto gods whom he regarded as “Aikido’s eternal guardians. It is believed that after his death in 1969 his soul take a place next to them. True budo is a work of love. It is a work of giving life to all beings, and not killing or struggling with each other. Love is the guardian deity of everything. Nothing can exist without it. Aikido is the realization of love. I want considerate people to listen to the voice of Aikido. It is not for correcting others; it is for correcting your own mind.